The University of Illinois at Chicago (UIC) welcomes the much-anticipated Disability Cultural Center (DCC) on its campus. Led by Roxana Stupp, former Director of the Disability Resource Center (DRC), the DCC strives to support and foster community building among students, staff, and faculty who identify as persons with disabilities or as disabled. Joining the Centers for Cultural Understanding and Social Change, the DCC is open to all who are interested in its mission and initiatives. Currently located on the first floor of the Richard J. Daley Library, the DCC opened its doors to the public on September 11, 2018, with a magnificent program featuring Dr. Carrie Sandahl, with a presentation entitled "What is Disability Culture?," and performances by leading Chicago artists with disabilities, including Nura Aly, Timotheus Gordon, Arlene Malinowski, Kris Lenzo, and Anita Kenney. The desire to create a community space for persons with disabilities on campus, as well as the legal necessity to accommodate students in the classroom, led to further conversations during the 2017-2018 academic year about how to best meet these needs. As Caryn Bills, Associate Chancellor for the Office for Access and Equity (OAE), puts it “[…] accommodations and interactions with faculty, staff, and students [are] a legal requirement, which is for students with disabilities that have to be accommodated in the academic environment.” As a result of these conversations the DRC became part of the Office for Access and Equity (OAE) in order to deal exclusively with accommodations, and the DCC was created in late February of 2018, under the Office of Diversity, with the goal of providing greater resources for programming and other support for people with disabilities on campus. Disability is a human experience. It was a great moment on campus to also start talking about disability as diversity. Brian Heyburn, also a DCC staff and PhD student in Disability Studies, states that intersectionality is very important to the work of the DCC. A term first coined by legal scholar Kimberlé W. Crenshaw, intersectionality refers to the ways in which intersecting forms of oppression are experienced. “We want to be sure that, in our center and our work, we are sensitive of the broader experience of identity,” says Heyburn. 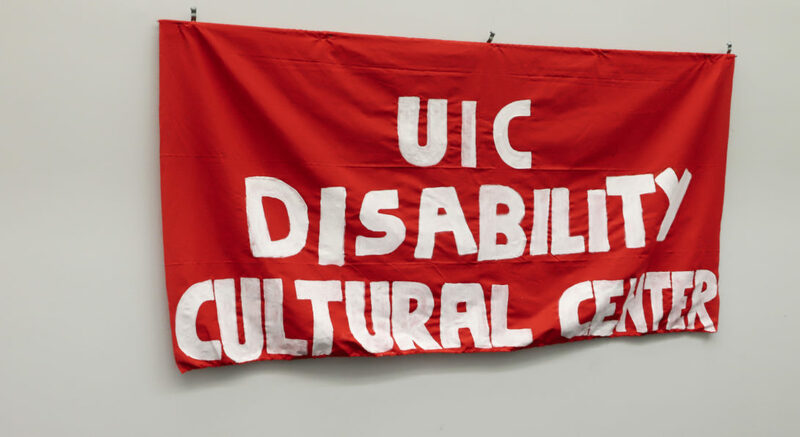 One of the goals of the DCC is to highlight the intersections among disability and other social identities, and to explore these connections through art and cultural programming in collaboration with the various Centers for Cultural Understanding and Social Change at UIC. We want to be sure that, in our center and our work, we are sensitive of the broader experience of identity. At the DRC, the staff is happy to see the DCC opening their doors to students, faculty, and staff. “It’s been great to see that the cultural piece [is continuing] with the Office of Diversity so that there can be better programming for students and staff—better understanding of the culture and the inclusivity that should exist. I think that with [Associate Chancellor and Vice Provost for Diversity] Amalia Pallares’ leadership, and those that are serving at the Cultural Center, [we] will see a rapidly growing center in the upcoming months” states Bills, Associate Chancellor for the Office for Access and Equity (OAE). Exhibition at the DCC in Daley Library. Since its establishment, the DCC has been busy planning various initiatives and programming series. One series is called “In Our Own Words: Conversations Matter.” Through conversations on various topics such as “Got my Syllabus: Now What?” and “What’s the Word? Ableism in Everyday Language,” the DCC aims to foster spaces for intentional, open, and respectful dialogue while continuing to further critical understandings of disability. Another series is “Disability Page Turners,” which highlights authors with disabilities who address disability narratives. This semester’s pick is Good Kings, Bad Kings by Susan Nussbaum, which won the PEN/Bellwether Prize for Socially Engaged Fiction and the Washington Post described as “not only shin[ing] a light on a segment of society often ignored, in art as well as life, but also is a really great read.” Check out the book from the library and join the first meet-up on September 20th. This is meant as a flexible reading space where students come and talk about the themes addressed in the books and explore how portrayals of people with disabilities may or may not resonate. Both Heyburn and Diego note that Disability Studies is a profoundly interdisciplinary field, attracting scholars from a variety of disciplines who are interested in exploring the experiences of people with disabilities, while placing disability within social, political, and economic contexts. Reaching the broader UIC community is also an important aspect of the work at the DCC, and staff is currently putting together a lecture series addressing topics related to disability. This series hopes to expand the understanding of disabilities here on campus and challenge how we see disability beyond the classroom—including our perceptions of visible and invisible disabilities.